This roundtravel is a sample itineraries (see next Tab) of a much wider variety of possible tailor made travels. Contact us with your special travel wishes. Departures: this trip can be tailormade at a time to suit you throughout the year and can be adapted to suit your interests, budget and requirements. It is still possible to travel to a country where you don´t need to look for old traditions & folklore. All integrated in daily life in a natural way. In Bolivia you find it still everywhere. On this round travel you will meet an unique combination of magnificent landscapes, a great variety of scenery and ethnic groups that will surprise you. The high Andean plain or Altiplano with Lake Titicaca & immense saltplain of Uyunyi, the Amazonian jungle, the high snowy peaks of the Andes, the rich Andean valleys, and the colonial cities which have been declared as cultural heritage of mankind, you will experience it all this richness and beauty in this roundtrip of 24 days. And all of this accompanied with the warm hospitality, humour and curiosity of the Bolivian people. Over 32 ethnic groups which make up a cultural, linguistic and folkloric mosaic that will allow you to share and enjoy unforgettable moments... A round trip with a high level of accommodation to relax & enjoy of all your impressions and to never forget! Bolivia is considered for its people as a cosmic synthesis of the world. Bolivia is one of the 8 countries in the world with the greatest variety of species of plant & animal life. All transfers, excursions & accommodations are arranged for you by our agent in la Paz. The accommodations are excellent 3-4 star Bolivian hotels, all selected for a specific setting & ambience. The excursions are all private & guided by English speaking local guides. We can also offer group pool tours or standard round tours for another price. However the tour offered is one of the best itineraries & is all private and will be worth its value for an unforgettable experience of 25 days. We can also arrange specialized private treks & ascents in the Cordillera Real with one of the best & reliable climbing agencies. The itinerary can be modified to your personal wishes including departure date, duration, accommodation used & how long you spend in each destination. Day 1: La Paz. You will be met at the airport & brought to your hotel (3 stars), a colonial house in a lively and atmospheric quarter of the city centre. .
Day 2: La Paz. Private 3 hour guided tour through the city. Day 3: Day trip. Visit the pre-Incas archaeological ruins of the important Tiwanaku Culture (800 BC) with the famous Sun Gate &Bennett monolith, recently returned from La Paz after almost 70 years. Day 4-7: Amazon rainforest. Private tour for 4 days and 3 nights (full board) - boat trips, pirhana fishing, walks in search or wildlife & the famous anaconda, indigenous community visits. Day 7, flight to La Paz. Day 8-9: Copacabana & Island of the Sun private tour - 2 days (full board), overnight on Island of the Sun. 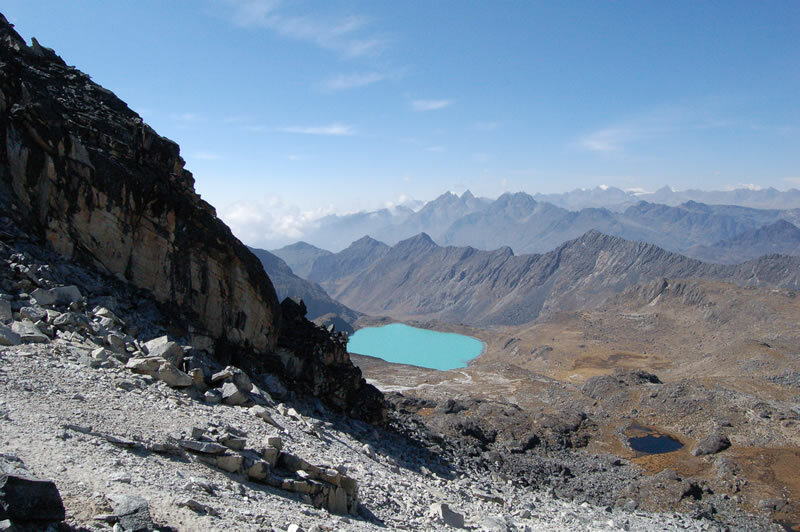 Day 10-12: Condoriri-Zongo private lama trek - 3 days, 2 nights (full board) including the magnificent 5,000m Jistaña and Apacheta passes and canyons. Day 12, private transportation back to hotel in La Paz, with several stopovers to appreciate the Milluni Indian Cemetery & amazing Andean high peaks. Day 13-15: Salar de Uyunyi private tour - 3 days, 3 nights. The start needs to be planned on a Tuesday or Friday in order to take the train to Uyunyi (otherwise you have to travel by bus at night or on Saturdays there is a tourist bus departure at 9am). Hotel Uyunyi (4 stars). Depart to the Salt Lake visiting Colchani, a salt extracting village, and Fish Island (Isla Pescado) or Incahuasi, populated by giant cactuses. Visit of mummy cave above Coquesa, and hikers can climb some of the sacred volcano for a magnificent view over the saltplain and towards the top of Tunupa. Day 16: Local bus from Uyuni to Potosí. This will be a little uncomfortable travelling day sharing simple transport as the local Bolivians do. Day 17: Potosi mine, private excursion. 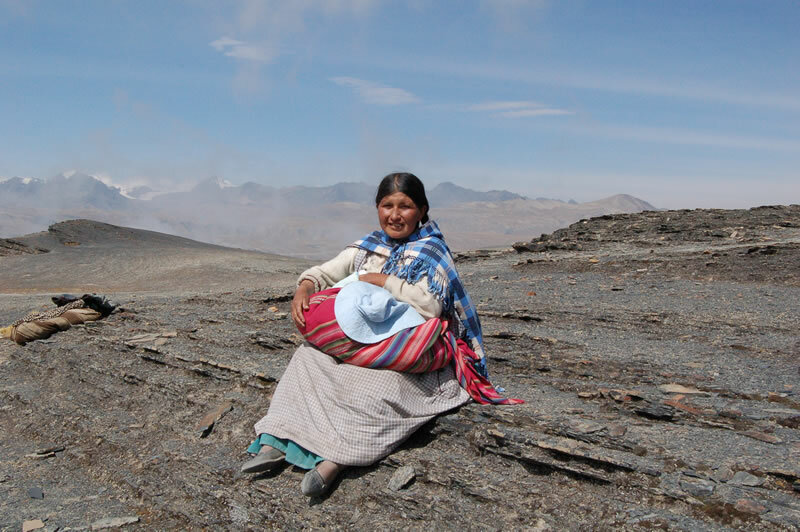 At an altitude of 4600 metres high, you visit one of the world’s few mines that preserves almost unchanged mitayo or indigenous miners' working techniques. Day 18: Private transfer from Potosí to Sucre & pm excursion to the Dinosaurs Footprints. Day 19: Sucre. Private city tour & visit the indigenous community Jatun Yampara, to see their culture, houses, textiles & ceramics. Hotel in Sucre. Day 20: Transfer to airport for flight Sucre-Santa Cruz. On arrival, transfer to Hotel Santa Cruz (4 star). Day 21-22: Private excursion to the Missions - 2 days, 1 night. Visit San Javier (220 kms), a tour through 18th century architectural jewels including San Javier’s church. Day 22, visit the 1756 church, Missions and Chiquitano museums and handicraft stores, and return to Santa Cruz hotel stopping off at Sapocó Lagoon. Day 23: Private tour Refugio Volcanes (Parque Amboro Sur). Visit to the cloud forest to watch birdlife, see orchids and immerse with nature. Overnight in Refugio Volcanes, and from here you continue directly to Samaipata. Day 24: Private day excursion to Samaipata, a picturesque colonial town 120 kms from the city with its spectacular Inca Fortress (El Fuerte) at 1950 m, the last bastion of the Incas. Hotel Santa Cruz (4 stars). Day 25: Transfer from Hotel Santa Cruz to airport for your international flight.